Although the legal and trade outcomes from Brexit are unknown, the underlying demand for increased manufacturing efficiency and flexibility to compete in world markets is undiminished. However, as Bruce Clothier, CEO of Fraser Anti-Static Techniques explains production efficiencies cannot always be achieved by new equipment alone. The UK plastics industry is a perfect example of this, where changing consumer demands have had a direct triple impact upon production materials, processes and production speeds. 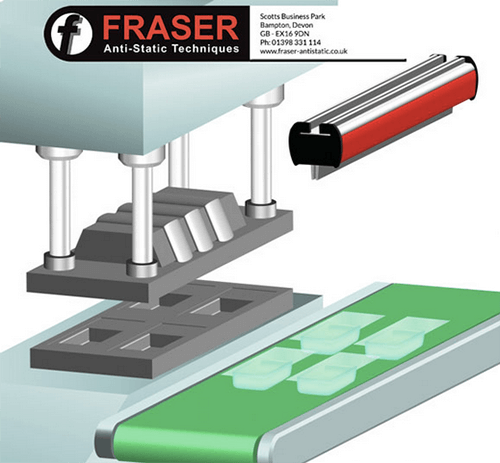 As a result, Fraser Anti-Static Techniques has developed a range of high performance elimination equipment, including the 3024 and NEOS 24V DC range. These are used extensively throughout the world, with market leading features such as remote monitoring, 100% coverage and variable output optimisation. In order to solve complex static elimination issues, Fraser Anti-Static also has a UK based technical team, and over 60 international partners all available for site visits and investigations with a strong track record of success in finding and eliminating static problems.